Crown has extended its well-established, multi-award-winning QuickPick® Remote order picking technology to cover an even broader range of applications. From now on, the system is also available for the lifting-fork and scissors-lift models in the GPC 3000 Series, the multi-purpose order pickers in the MPC 3000 Series, and the TC 3000 Series of tow tractors. “With our QuickPick Remote technology, Crown has developed a solution for enhancing safety and efficiency that includes stand-out ergonomics and delivers real-world benefits plus genuine added value in multiple applications. The system has clearly demonstrated how well it performs in practice over millions of hours of operation for a variety of customers. By continuing to develop the system’s performance parameters, we’ve now been able to extend this technology to other applications. This means we can continue to improve the quality of work in warehouses and help enhance productivity even further,” explains Gary Thurner, Product Marketing Manager at Crown. QuickPick Remote is a genuinely unique innovation that streamlines working processes, creating a win-win situation for fleet managers and their hardworking operators. The system is easy to set up, requiring neither network bandwidth nor additional IT expenditure – it can be incorporated directly into customers’ warehouse environments as a cost-effective, self-sufficient solution. As QuickPick Remote is a dual-mode solution, customers can still operate the trucks manually when needed. GPC order pickers with fork or scissors lifts can be used to raise picking pallets to various optimal working heights. The variant with lifting forks can lift a pallet weighing up to 1,200 kg to a height of 960 mm, while the rugged scissor-lift model is capable of simultaneously lifting two pallets weighing 1,000 kg each to a height of 850 mm. This optimised positioning offers clear benefits in terms of ergonomics and productivity, reducing the risk of damage to products and enabling consistently high picking performance that can now be further enhanced by taking advantage of QuickPick Remote technology. The Crown MPC 3000 Series combines the advantages of an order picker with the capabilities of a counterbalanced forklift truck. 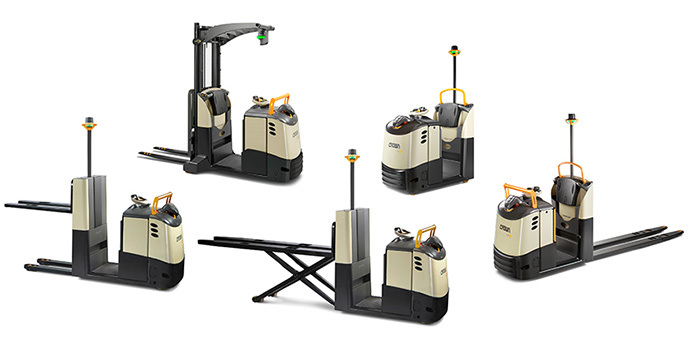 With travel speeds of up to 12.5 km/h, a lifting capacity of up to 1,200 kg and lifting heights of up to 4.3 metres, these trucks are flexible enough to be used in a wide variety of warehouse applications, including order picking, put-aways and replenishment, long-distance transport and sandwich stacking. When used for order picking, they are versatile enough for operators to be able to replenish empty pick slots without changing to another vehicle. Tow tractors in Crown’s TC 3000 Series are the perfect solution for high-pressure transport and supply activities in production environments, warehouses and distribution hubs. Combined with QuickPick Remote, they can save significant time in order picking or production supply logistics while helping operators to stay relaxed and alert. Crown first introduced its QuickPick Remote technology in 2014, initially for low-level order picking. By early 2015, the company was offering an upgraded variant capable of controlling the lift and lower functions in Crown’s ES 4000 and ET 4000 Series stackers. Since QuickPick Remote was first launched, industry commentators have regularly acknowledged the highly innovative thinking behind the remote-control system, as well as its exceptional efficiency. The technology has received coveted international awards, including the IFOY Award (International Forklift Truck of the Year), International Design Excellence Award (IDEA), iF Design Award and German Design Award. Since 1962, prestigious international design institutions and associations have granted more than 100 awards to forklift trucks manufactured by Crown. For more information, please visit http://www.crown.com.